Outlook Mac Exporter software provides functionality to precisely backup Mac Outlook 2011 to Windows Outlook with complete data items simultaneously. This tool can easily export Mac Outlook 2016 to PST with items such as emails, contacts, calendars, notes without any file size limitation. How Software Helps User to Accomplish Their Goals? Mac Outlook 2011 to PST software by SysTools got the best utility award for successfully error free delivering Mac Outlook files output in PST format. 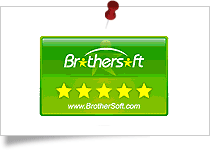 SysTools Mac Outlook 2016 to PST Software got 5 star rating from BrotherSoft for effectively export Mac Outlook data files to Outlook PST file format. CNET rates Outlook 2016 Mac to Windows Outlook converter with 5 stars for providing best services in transferring Mac Outlook data files to PST. 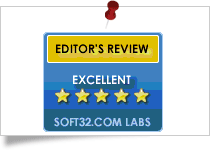 Soft32 gives the ultimate performance award to Mac Outlook Exporter by SysTools. Its performance in backup Mac Outlook 2011 to PST files is best. Happy with the performance of the Outlook 2016 For Mac to PST exporter software. I used this software to precisely export Mac Outlook data to PST with attachments and other folders. The software brilliantly does work for me without any extra effort. Best part of the software is that its demo version is free to download without any information. Outlook Mac Export Tool is a complete software to save Mac Outlook archive files to PST/EML/MSG format. It also generates a preview of scanned data instantly. One can easily read the emails, contacts, calendars, tasks, notes etc., without any interruption. The software allows to preview emails along with associated attachments. It automatically generates the preview of any kind of attachments whether is PDF, Word, Images or any other type of document format. Easily preview the contacts with important metadata information such as name, nickname, birth date, spouse, anniversary etc. The calendar entries can be easily viewed along with important information such as events, appointment, meetings etc. View the important data stored in the tasks of Mac Outlook. 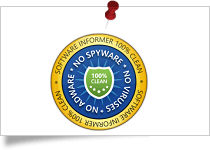 The software guarantees the 100% safe and secure migration of Mac Outlook Archive files to Outlook PST. Apart from this, it also facilitates the selective migration of Outlook for Mac mailbox data items to multiple file formats. The simple user interface added extra appeal to the capability of the tool. Sometimes, it is the foremost requirement of the user to export only very few mailbox items from Outlook For Mac archives to multiple formats. For users who willing to save only contacts, then this tool has the potential to fulfill their wish within a few numbers of clicks. Apart from exporting selective emails and contacts items, it also facilitates export calendars, tasks, notes etc., to multiple file formats. What More One Can Export With SysTools Outlook Mac Exporter to Multiple Formats? 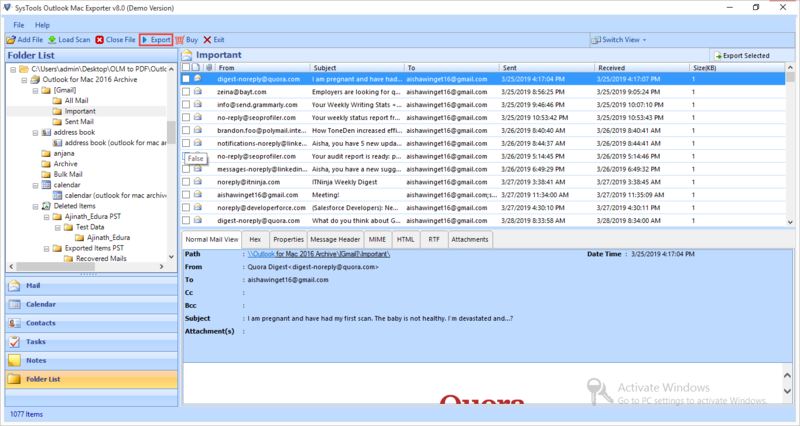 Email Messages By using the software, one can easily perform the migration process from Outlook For Mac archive to PST. During the whole migration operation, the data belongs to emails get converted and preserve. This data includes images, signature, etc. Moreover, the user can apply the date filter to export only selected data. Folders The software export all the folders from Outlook For Mac archives to PST which includes Inbox, Drafts, Deleted Items, Junk Email, Sent Items, Search Folders, RSS Feeds, Calendars, Tasks, Contacts, Notes etc. Note: It will strictly preserve the original folder structure. Date Range Filters Export selective data from Mac Outlook with the help of advance date filter option. Priority & Category It strictly preserves the priority of the emails and category after undergoing the file conversion process. Calendar Data One can easily export calendar data with the inclusion of all the crucial information such as subject, time, location, start time, end time etc. Apart from this, metadata such as calendar appointments, meeting requests, recurring appointments, etc will be easily exported. Calendar Attachments If there is an attachment associated with the calendar i.e. business cards, Outlook item and signature then it also gets exported from Mac Outlook archive file to PST format. Reminders The reminder conversion is one of the foremost need of the user. With the help of this tool, one can easily export the appointment reminder settings. Contacts With the help of the software one can easily export Mac Outlook contacts data to multiple formats. The data includes the name, birth date, nickname, spouse name, etc. Phone Number Export all type of phone number whether it is primary, home or business number with its attributes. Address With the help of the tool, one can easily export address listed in the contacts which include home, business, and other address. Tasks This tool provides the facility to the end users to migrate the tasks with its associated metadata such as subject, start date, status, due date, priority, reminder, and owner info. Reminder The tasks with the reminder associated will also be exported to desired file formats. Notes If the Outlook For Mac archive OLM file contains any notes then software allows the user to preview it and provides an option to export into the resultant file format. Profile Folder When the user exports the Mac Outlook mailbox into OLM file. If there are multiple profiles configured in the Mac Outlook, then exported OLM file contains the data of the profile. The software maintains the exact folder hierarchy to distinguish data of the multiple profiles. The same hierarchy also contained in the resultant files. Software performs a full fledged migration from Outlook 2011 Mac to Outlook PST File Format. You can export emails, contacts, calendars, tasks from Mac Outlook file to .pst format of UNICODE type. The tool will convert emails along with attachments and embed them within the converted mails. It can export attachments like: images, documents, etc. ; in proper formatting. You can take backup of Mac Outlook 2011 file emails as EML or MSG formats. This makes it easier for you to import Outlook Mac file emails in other applications such as Windows Live Mail, Outlook Express etc. For Outlook Mac 2011 to MSG conversion, you have to select an appropriate naming convention to save an email. You can save individual messages by its subject, MD5, Auto increment, etc. Outlook 2011 to PST Migrator Software will generate the preview of all Outlook Mac items like: calendars, contacts, tasks, Notes, emails along with attachments with properties like: to, from, date, size, subject, Contact details, email id etc. ; kept intact. You can reduce the size of resultant PST file by splitting it into multiple parts by size. This will create smaller PST files of similar sizes that are easier to manage; from a large PST file. Thus helps in taking the backup of Mac Outlook 2019, 2016 & 2011 OLM files. 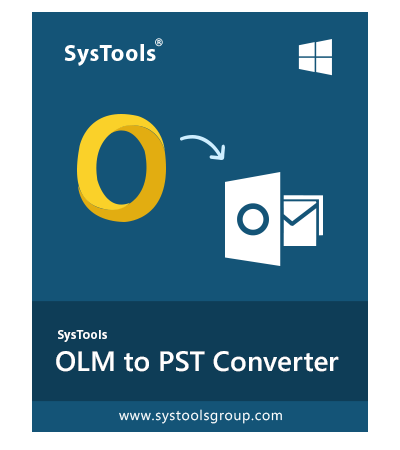 You can export items of your choice from Outlook 2011 file to PST / EML or MSG formats. Put a tick mark on the item that you need to convert and software will export all selected items at once. Software performs a quick scanning of Outlook Mac 2016 file and loads all the items with item count shown. You can see the number of items present in each folder; as you click on them. Outlook For Mac 2016 to PST ensures that original structure of folder and subfolders remains the same. Thus, the created PST file will have a folder tree structure similar to Mac Outlook 2011 file. If you want to batch export Outlook 2011 to PST / EML or MSG then check / uncheck the folders that you would like to export from Outlook Mac file to Windows Outlook PST file format. Once the scanning of Mac 2011 file get complete, you will be asked to save scanned file. In this way, you can save time to re-scan the same file, if you start over again. You will get the complete experience of MS Outlook from software interface. Outlook Mac 2011 to MSG converter appears with an Outlook styled interface making it user-friendly to backup Outlook 2016 mac . 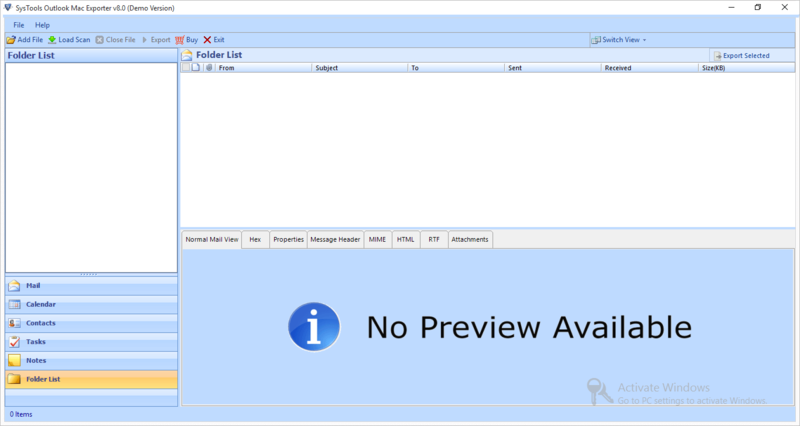 Outlook 2011 to PST converter offers a horizontal screen view mode; just like Outlook. But if you want; switch the entire screen view mode from horizontal to vertical. Outlook Mac Exporter software allows to backup Mac Outlook 2016 & 2011 in PST file format with attachment. With PST file, you will get option to access data on any platform. As PST file is supported by both Windows and Mac Outlook. Demo version of Outlook Mac Exporter can export & Save 25 Outlook 2011/2016 items to PST file. Step 9 –: Save report after completion of export Mac Outlook 2016 to PST. What are the features of this utility that makes it the best tool among others? The process of importing Mac Outlook OLM file to Outlook 2016 is very simple process. Finally click on Export button to start the process. What is the Mac Outlook 2016 & Outlook 2011 file location? Can I Install the Software on My Mac OS X? No, you cannot install or use the Outlook 2011 to PST software on any Mac machine. Outlook Mac exporter is a windows based tool and can be used on any windows machine. Does the Software Supports Windows 10 Version? Yes, you can use the software on a windows 10 machine to convert outlook 2011 to outlook 2016, 2013 and all previous versions. What is the Limitation of Outlook Mac 2011 File Size that I Can Export Outlook 2011 Mac to PST? There is no limitation on size of Mac 2011 file. You can export Outlook 2011 Mac file of any size from Outlook 2011 to Outlook 2016,2013,2007,2003,2000 PST file. How Can I Create Mac File? As Outlook 2011 Mac does not create Outlook 2011 file by default, you need to export Mac Outlook 2011 file format. Follow the steps and see how to create a Mac 2011 file. What will be the Format of PST File that Software Creates? Backup Outlook 2011 to PST Converter Creates PST file in UNICODE format. How Can I Bring Mac File to Windows Machine? Mac file is the database file of Outlook 2011 for Mac. You only need to copy this file and move it into any windows machine via pen drive or any other flash drive. After that, you can use this tool to perform back up of Outlook 2011 to PST. Can I Open the PST File Created on Windows Machine to Outlook Mac? Yes, you can open and view the PST file created on windows machine into your Outlook for Mac. This error may occur if Outlook is not properly installed or configured on your machine. Make sure that the Outlook is properly installed and configured. If you still face issues, contact our technical support team. I have used Outlook mac exporter for the first time in order to export the outlook 2011 to outlook 2010 on windows PC. It was a great experience for me to work with your technical team and with their help i have successfully accomplished the migration"
This is the best software to export Outlook Mac 2011 files to PST format. I provides various features to transfer Mac data to PST without any file limitation. It design in such a manner that anybody can use this tool easily. I use windows PC at my home while my work machine is Mac and due to incompatibility of both the platforms I have faced a lot of issues. Thanks to Outlook Mac Exporter converter as I can now access Outlook 2011 data into Outlook 2013 on my windows machine." I was looking for the solution to migrate Outlook 2016 Mac to Windows. But I did not get any solution as per my requirements. Then someone has suggested me to go with SysTools Outlook Mac to PST Exporter software. I tried the free version of the software and found it quite useful and relevant as per my need. The process of migration of Outlook for Mac 2016 to Windows Outlook is really cumbersome process but with the help of Outlook Mac Exporter, I easily did the task without any difficulty. The best part of the software is that its user interface is so simple & enhanced. Download & install Outlook Mac Exporter tool on Windows machine to Export Mac Outlook to Windows Outlook 2019/2016/2011. As soon as, software loads OLM file, it is available for preview in view modes provided by the software. 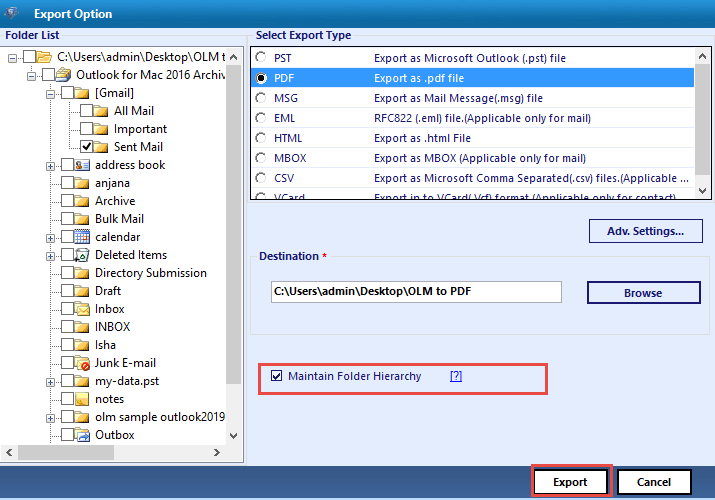 Select desired option from the multiple available options to export Mac Outlook 2019 to PST, EML, MSG file format with associated mailbox data.